Nowadays, people put a lot of emphasis on taking care of their pets. Our furry (and sometimes scaley) little friends also have needs of their own, which is where Pet Supermarket comes into play. Here you can buy food for dogs, cats, spiders, lizards, along with accessories and lots of other great products to keep your pets happy and healthy. And to make matters better, you can save on your entire order by using a free Pet Supermarket discount code! As pet lovers themselves, the founding team behind Pet Supermarket have an insiders perspective on just what kinds of support you need to look after your pet, and the kinds of products that will help you along the way. First established in 2004, they are a London-based company solely based online, which allows them to provide you with competitive prices across their whole range from food to health care and all the tasty treats in between. Whilst having a pet is a whole lot of fun and games, there’s a lot of cost involved in making sure your closest companion stays fit and healthy. Their website caters to pets of all shapes and sizes, and features all of the major pet products and brands as well as plenty of smaller, independent retailers who’ve come up with a whole host of innovative ways to make sure your pets are well-looked after. Reduce the price of everyday pet necessities using a free Pet Supermarket discount code when you shop with them and make a generous saving on food and other supplies. Just pick up a Pet Supermarket voucher from our website and redeem it when you check out online! First of all, bound over to our website and pick up your free Pet Supermarket voucher, and then scurry over to the Pet Supermarket homepage to begin browsing. If you’re in a rush, use their search function to reach the product you’re looking for, or scan through their huge range of pet-related products and then add the items you wish to purchase to your shopping basket. Review your basket as frequently as you need to by clicking the icon in the top right hand side of the screen whilst you continue to shop. If you’re already ready to checkout, simply click the icon once to be taken to the order summary page, it’s here that you will be able to locate the box underneath your order summary where you can enter in your Pet Supermarket discount code then click “Apply”. The discount will be automatically included and your total price updated. At this stage you will be prompted to create an account with Pet Supermarket, so that you can track the delivery of your order when its on the way to you. This will also make shopping with them next time much quicker and more streamlined. Tell Rover to get ready for some tasty treats as once you’ve entered your personal information, your order will be confirmed and soon on its way out to you from Pet Supermarket! Designed by pet lovers, for pet lovers, their concept is centred around providing all the necessary requirements to keep your pet healthy, at affordable prices. Make an extra saving when buying food, petcare and treats for your furry friends by shopping with Pet Supermarket codes. All you need to do is give our website a click on your way to the Pet Supermarket online shop, and keep your Pet Supermarket voucher ready for when you finally reach the checkout! To find out more about the company, view special advertisements, view interesting interviews and reports, be sure to visit the Pet Supermarket YouTube channel. You never know when a Pet Supermarket discount code might be exclusively offered there! Deciding to care for an animal is not a decision to be taken lightly, and as all pet owners know, there is plenty to think about after the excitement of bringing a new pet home has subsided. Whether its your first pet or you’re an experienced owner, make sure that your pets needs are catered for whilst making an attractive saving at the same time! Simply shop online using your free Pet Supermarket coupon across the following products for dogs, cats and lots of other kinds of pets too! Every product from their range has been specially formulated to give your pet all the nutrients they need—as well as plenty of ideas for pet-proofing your home, and ensuring they don’t get into any trouble! From Great Danes to Siberian hamsters, they’ve got all the tools you need to keep your pet in shape. Take a look at their full list of brands and don’t forget to pick up your free Pet Supermarket discount code from us to make a saving! Apart from Amazon UK there are other online shops at couporando.co.uk in category Pets & Accessories. Nice coupons and rabates to Monster Pet Supplies, Petmeds, Pets at Home are waiting to be found! Want to spend every precious moment with your pet? Then don’t waste any more valuable time travelling to and from the pet shop! Now you can cuddle up with them and shop together for all the food and other supplies they need from the comfort of your own living room. You’ll be ordering all kinds of treats and toys for them to enjoy in no time if you just follow the simple steps below, all you need to do is type in your free Pet Supermarket coupon when you pay to make an extra saving! 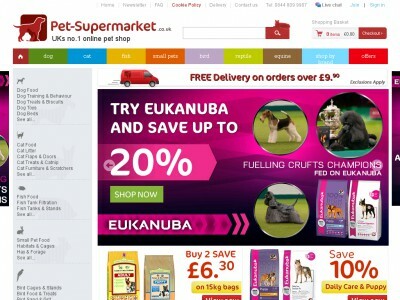 Designed to be quick and easy to use, their website features colourful tabs so you can navigate to the right department, or have a look at the weekly Pet Supermarket offers on their homepage. If you know exactly the product your pet requires, use the search function to navigate directly to the relevant department. When an item from your shopping list appears in the search, click on its photo to be taken to a more detailed page featuring specific information about how your pet can benefit from it, exactly how and where it’s made, and its composition. Take care to check its age-appropriate for your pet, especially if they’re younger than 1 year old. Treat your pet to all kinds of fancy presents, or stay on track with practical food and health care. Either way, take some time to browse the various products they have in stock and check you’re up to date with everything your pet needs. When you are ready to make your final choices, simply click “Add to Cart” on the item’s page and proceed directly to the “Checkout” area. If you have a Pet Supermarket voucher locate the box underneath your order summary where you can enter in your Pet Supermarket discount code then click “Apply”. The discount will be automatically applied and your total price updated. Once you’ve double checked all the information about your order, you will need to register an account with Pet Supermarket, this will make shopping with them next time quicker and more convenient, and allow to track your order whilst its on its way to you. Complete all your personal data and payment information, choose your delivery options then just wait for your purchases to arrive in the post. Enjoy watching your happy pet with their new toys, and make a great saving on their everyday needs too! Our pets deserve to be treated with love and care, and what better way to reward them for all the affection they lavish upon us than with a tasty meal? Upgrade from tasteless synthetic kibbles and have your pet eat like a king for less when you visit the Pet Supermarket website today. Much to their delight, you’ll be switching to the better brand for good when you see what a generous saving there is to be made with your free Pet Supermarket coupon from our website! 1. Check that it is at least 7 working days since your item was delivered, for sale items this may differ. 2. Repackage the items unopened, with all the labels still intact and undamaged. The items should all remain in a re-saleable condition. Please note that items which are customised, part used or are veterinary medications for your pet are non-refundable. 3. Make sure to include a note of your customer reference number within your parcel, as well stating the reason why you are returning the item, and attach the returns address to the outside of your packet. Don’t forget to send your parcel recorded in case it should go astray. 4. Receive a full refund from Pet Supermarket within a couple of weeks. Alternatively you may also exchange your items for another product too! Find out about special promotions and deals on their whole shop, as well as updates about of the latest Pet Supermarket coupon! Buy now online at www.pet-supermarket.co.uk/. If you’re like me and have dogs, cats, or other exotic pets like spiders or lizards in your house, then Pet-supermarket.co.uk is a great place to make sure you’re pets are getting the supplies they need. A Pet Supermarket discount code can guarantee a good price as well, and luckily, Pet Supermarket coupons are easy to obtain. A Pet Supermarket code is free to use and registration free, and lets you save on important pet food and accessories. So why wait? Grab your Pet Supermarket voucher today to start saving more on your beloved pets!